Our Shea Essential Neem System consist of 4 superior products. 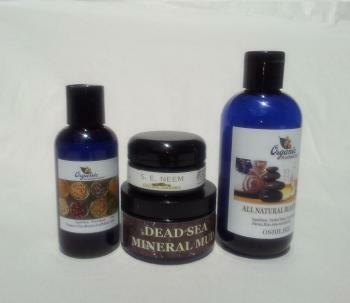 Liquefied Black Soap, Dead Sea Mineral Mud, Witch Hazel Extract and Shea Essential Neem. This System is designed to help you overcome the symptoms and visible affect of Dermatitis and Skin Disorders with no side affects. Our Shea Essential Neem System consist of 4 superior products. Liquefied Black Soap is a All Natural Soap that cleanses the hair and body completely and leaves no residue of any kind. Black Soap has no sulfates or synthetic chemicals that are harmful to the hair follicles or skin lipid. It is highly concentrated so a little goes a long way. Dead Sea Mineral Mud is the black mud harvested from the banks of The Dead Sea. Dead Sea Mineral Mud contains 26 minerals including Magnesium, calcium, bromine and potassium. Twelve of The Dead Sea minerals do not exist in any other sea or ocean in the world. A Dead Sea Mineral Mud Mask minimizes pores, draws out toxins, restores your skin's pH balance and helps relieve the symptoms of Acne. Shea Essential Neem is Certified Virgin Organic Shea Butter blended with our specialized Organic Botanical Extracts, Virgin Organic Seed and Essential Oils designed to have a anti-inflammatory, anti-bacterial, anti-viral, anti-fungal, anti-carcinogenic and deep moisturizing effect on the skin which can eliminates the drying and itching symptoms associated with Dermatitis and Skin Disorders of many kinds with no side affects. Organic Shea Butter is Organic UV protection. One of the Organic Botanical Extracts we use in this formulation is Neem Leaf Extract which the follow study confirms it’s effectiveness at treating inflammation, skin diseases and more! Curr Med Chem Anticancer Agents. 2005 Mar;5(2):149-6. Hi Kathleen: What a blessing you are. I thank God for your spirit of counsel and most of all for your products. I went to the doctor and tried prescribed creams that did not work. NEEM: When I showed you the area on my foot, you suggested I try your S.E. Neem cream. Well not only is it working my skin is coming back on this area, and the itching has subsided. Words can't describe my heartfelt thanks to you for your wisdom, advice and products.